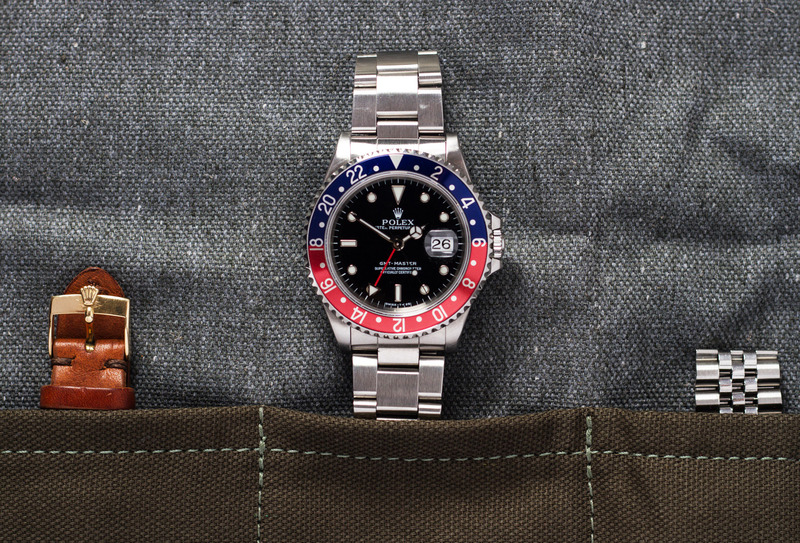 We managed to get our hands on another beautiful, full set Rolex GMT-Master with reference 16700. This one has an attractive inlay where the red part of the ‘pepsi’ bezel has slightly turned pink-ish. Cool thing is, the red GMT hand matches this pink-ish discoloration. The watch was sold in 1998 by a Dutch Rolex retailer in The Hague and is accompanied by the original inner and outer box, punched warranty, booklets, hangtag and extra links to the 78360 Oyster bracelet. The U-serial GMT is known for the fact that the dial is marked with the SWISS-T<25 printing below the six o’clock position, when in fact all luminous material is luminova, including the hands. These are older dials that were used around the time Rolex started the transition from Tritium to Luminova and it was probably cost efficient to use the older dials first, before producing new ones. This only occurred during the production of the U serial, that makes this a rare piece and a great buy as a future vintage investment! The entire watch was fully serviced and we replaced the sapphire crystal due to a multitude of chips on the edge of the sapphire. This GMT with pink-ish accents will be sold with a 12 month warranty.